Business Christmas Cards need to be unique so that they can stand out from the other corporate Christmas greeting cards. Businesses are sending out Christmas cards to clients each year. This is a tradition and it's also a marketing tool to keep your company in the mind of your clients. A unique business Christmas greeting card will keep your holiday greeting card from being thrown into the trash bin or being lost in the many others that are being received by your clients. But how can you make your holiday cards special and unique? Well, one way to make them unique is to make them yourself. The trend now is to send out handmade greeting cards. Homemade Christmas cards are not cheap. They can be made to look expensive. It's the materials you use to make the company Christmas cards with that give them a professional and expensive look. 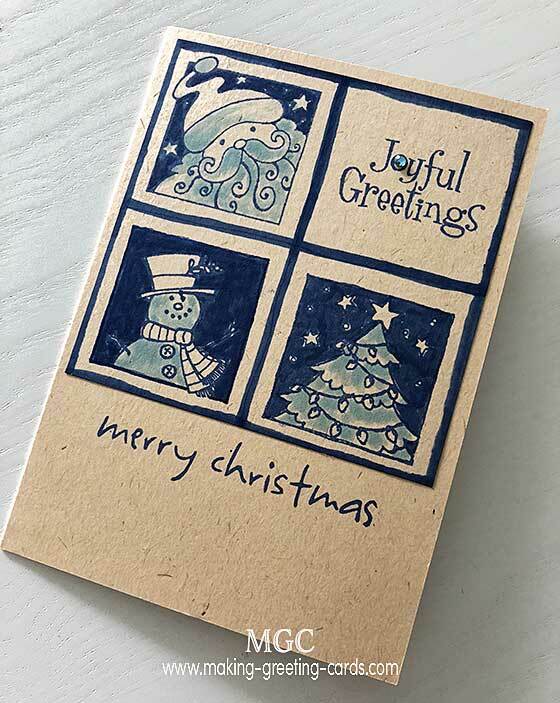 Why Send Handmade Business Christmas Cards? They tell your clients that they are special. Well, as the saying goes; when you care enough, you make it yourself. You can personalize them. Use a Christmas card design that tells the kind of business you do. Or a color theme that is in line with your company logo. Another idea is to use an image that describes something that your client can identify with. Well, use your imagination and make your Christmas greeting cards your clients will keep and treasure. Most of all, because handmade greeting cards are in - they are trendy and unique and most CEOs and executives are buying and sending high quality handmade greeting cards. Use good quality card stocks. There are beautiful card making paper in the stores today. You can easily find them in scrapbooking stores. I believe Provo Crafts has some very good cardstock for card making. I love using their premium textured cardstock with white core. They come in a stack with 58 sheets of 12 x 12 paper thick enough for making greeting cards. Use embellishments tastefully. Do not over-do it. Yes, do not overcrowd your handmade greeting cards with embellishments. Choose a color scheme. Use two or the most three colors. Have a Christmas image or Christmas message as a focus point - something on the card that draws the eyes immediately. Layer your cards with good co-ordinating cardstock to give them an expensive look. Make straight cuts by using sharp knife or paper trimmer. Make sure that the adhesive you use stick well. Do not want your business Christmas cards falling apart in the recipients hands. I love using Uhu glue because they are strong enough for quite heavy embellishments. Work with clean hands so do put a pack of baby wipes next to you while working on your Christmas cards. For really important clients, you might even want to use semi precious gemstones for embellishments. Make sure that your envelopes are the right size. Buy the envelopes first, then make your Christmas cards to fit the envelopes. Use Christmas rubber stamps. I love using the clear stamps so that I can see where I'm stamping. Rubber stamps give the cards a professional look. Embossing your business Christmas cards will also help make them look better. Use your embossing heat gun to go over the card stock first to remove any statics so that embossing powder will adhere to only the stamped image. Two Christmas cards created for established companies. Click here to view them. Here are two of those I made for my company's clients. These are business Christmas greeting cards any small businesses can send to their customers. For example, beauty salon owners, boutique owners, real estate agents, insurance agents, fitness instructors, etc. They are more personal and are more fun to make. For these, you do not need to adhere too strictly to the card making tips mentioned above. Here's one I created sometime back. It's blue in colour and the Christmas card design can also be used for Christmas cards for men. These are beautiful Christmas Cards for business use created by some ladies of Making Greeting Cards group. Need more Christmas card making ideas? Click here to view more Christmas Card Designs uploaded by readers. Why send paper Christmas cards. Tips : Add a personalised business Holiday Card greetings to your handmade Christmas cards.